Things can change in time. It seems that especially this century -not new anymore- is somehow gifted -or cursed from the other way around- with this wind. Regardless of who is responsible for triggering the initial waves, each and every living thing is somehow meant to be responsible to find its new location and position according to these spontaneous or gradual alterations. Well, humankind can easily be said to have some more proactive roles in this process and some may find the courage to lead the wind or at least stay away the mainstream, where the rest are gone with the flow. This new post will be basically about the "change" itself, because the object I am exposed to lately -in a live performance in Lantaren Venster in Rotterdam, is a new album called "She Moves On" from one of my favorite vocalists, Youn Sun Nah. Before that, starting from the "Voyage" in 2009, she has recorded three very nice albums with the fine European jazz label ACT, each of which are precious pieces of my archive. (you can find one of my previous posts on an album of hers:http://fatih-erkan.blogspot.nl/2014/02/youn-sun-nahs-2013-album-lento-and-youn.html). Although the first album carries the "change" theme inherently within the title -mostly because of her first move from hometown to Paris-, Youn Sun Nah was kind of mentioning that she is living with the naïve South Korean singer with the next album called "Same Girl". The third album Lento was already a big step, increasing the international exposure reflected in the album sales, but we can easily say that the overall sound and style of both her vocal and arrangements were around the same line within these three albums. Now, Youn Sun Nah really moves on with the last album changing not only the way she sings but also the style of the band. The real change indeed is also related to the fact that the impressive New York based band is much more in the generated sound rather than being an accompaniment for our crystal clear voice. To be honest, having Marc Ribot on guitars, Jamie Saft on keys ranging from piano to Hammond, Brad Jones on double bass and Dan Riesser on drums is already sufficient to create a very warm and cozy sound for a killer album. Adding a curved and a little bit Americanized version of the acrobatic voice of Youn Sun Nah on some catchy and cool arrangements (mostly from Jamie Saft, Vanessa Saft and Youn Sun Nah) with this band seems to have created the biggest step for Youn Sun Nah's singing career - probably opening the US scene for her more than ever. Specifically, I feel myself very lucky to be able to listen to this album firstly from LP record because the successful mastering seems to have very well fit with the timeless ambience and sound of the album. The first -the smooth introduction- track Traveller reminded me of the previous album's locomotive piece Lament mostly for its lyrics and cool voice of Youn Sun Nah. The standalone performance of the band is an abstract statement for the following blast. The second number is a very interesting arrangement for Lou Reed's Teach The Gifted Children and it really sounds like the blues and/or gospel connection of the album especially thanks to hot and impressive tones carried out by Marc Ribot. Consistent to the shuffling energy level throughout the album, Too Late -in contrast to the title and lyrics- invites you directly to hold your lover's hands and pull her/him to a sentimental cheek-to-cheek dance with its touchy fender tones and triplet rhythm sections from Brad Jones and Dan Riesser. 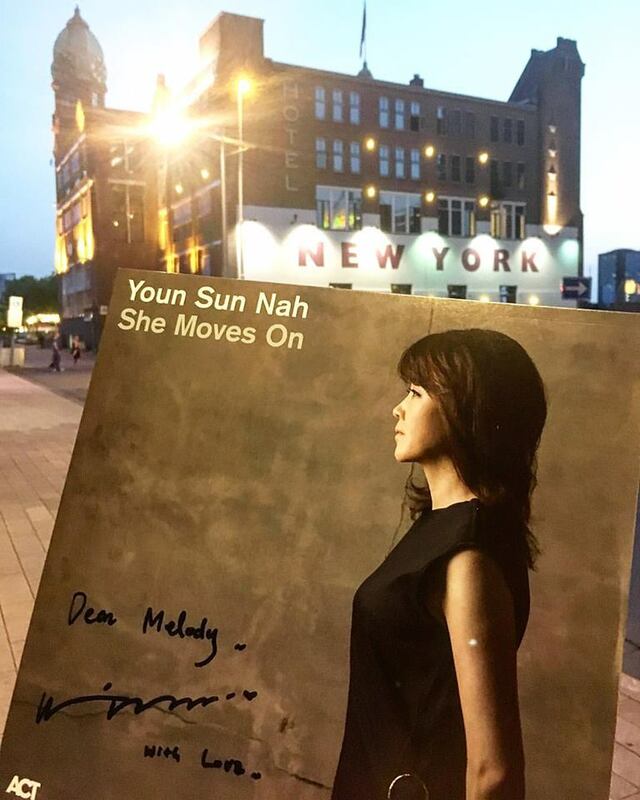 The title track is an energetic arrangement of Paul Simon's well known piece giving the clues of the inspiration behind the album and Youn Sun Nah's definitive vocal is very well blended with the impressive acoustic performance of Marc Ribot and funky Wurlitzer tone. No Other Name (a Noel Paul Stookey song) is a great acoustic duo of vocal and guitar, which once again shows what a great vocalist Youn Sun Nah is. A nice cover for Joni Mitchell's amazing song The Dawntreader is very well achieved by a very organic accompaniment between the band and Youn Sun Nah. Drifting (of Jimi Hendrix for sure) is especially impressive with again the nice guitar touches and nicely/softly reverberated vocal. The way the performance evolves into a nice guitar solo accompanied by a deep and back vocal finished by a chaotic ending is really something new for a Youn Sun Nah album. Started with amazing three notes from Kalimba played by Youn Sun Nah, Black Is The Color Of My True Love's Hair somehow connected to the singer's previous albums not only for this well known sound but also for the lyrics and the way she sings. Please give attention to the nice performance by Brad Jones. Like two pieces for the romantic soundtrack album of the same movie, Fools Rush In (Rube Bloom / Johnny Mercer) -especially thanks to the touchy vocal and hammond tone-and Evening Star -mostly thanks again to the warm accompaniment from Marc Ribbot- are the closing themes of this great album. Recorded by Vin Cin, mixed by Vin Cin & Jamie Saft in Sear Sound NY and mastered by Scott Huli at Masterdisk NY, the album is very successful sound design-wise. The seperation of different instruments and the locations on the stage can easily be heard. The album is produced by Jamie Saft who is also behind the nice arrangements. The executive producer is Hub Music.